“What’s so great about the truth? Try lying for a change – it’s the currency of the world”. “A Man and a Woman have one important thing in common at the start of a romance. They are both in love with him”. Two of the many quotes concerning this play, which is a drama of the game of sexuality and infidelity written by one of our most illustrious new playwrights, Patrick Marber, who served his apprenticeship writing for television, haveing written amongst others AFTER MISS JULIE starring Kathy Burke and Phil Daniels. He has co-written and appeared in the comedy programmes THE DAY TODAY, THE PAUL CALF VIDEO DIARY, KNOWING ME, KNOWING … WITH ALAN PARTRIDGE and THREE FIGHTS, TWO WEDDINGS AND A FUNERAL. 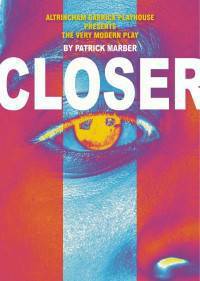 CLOSER is his second play after DEALER’S CHOICE and like the latter also won the Evening Standard Award for Best Comedy (amongst many others).